New Location in Northern VA has opened!! Since 2004 thousands of families, from all over the world, have benefited from our comprehensive Greenspan Floortime Programs. To truly help a child succeed it’s necessary to provide programs that are integrated under one philosophy, and support the child at home, as well as at our center. 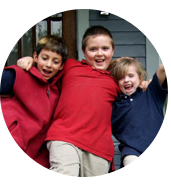 Every child’s program is designed to address their unique needs. Programs can include Occupational Therapy, Speech and Language Pathology, Social Opportunities, Visuo-Cognitive Therapy, and Parent Coaching. Instead of just treating a specific symptom or skill we look at the child as a whole. For example, communicating is more than just repeating or saying words. Communication is an emotionally driven capacity that occurs verbally and non verbally. When a child has difficulty with any part of their development, they can become emotionally more sensitive and negative behaviors can emerge. Dealing with the whole child assist the communication and the emotional repercussions of dealing with a weakness. By working on the physical and emotional elements of every challenge, and helping families support this growth at home, we can achieve comprehensive and lasting results.